While Ruth May continues to be sick, Orleanna gets better. Leah wonders if she’s accidentally made Ruth May sicker, so she prays to God, apologizing for her own sister’s disease. Meanwhile, Rachel continues cooking and cleaning for her sisters. Leah and Rachel argue: Leah criticizes Rachel for being a bad cook and heating the fire too hot, and Rachel lashes out, telling Leah that she should be silent, like Adah. Leah’s reaction to Ruth May’s sickness is very telling: she blames herself for no discernible reason. We’ve already seen Leah blaming herself for things beyond her control (her whiteness, her nationality, Methuselah’s cursing, etc.). Orleanna seems different now that she’s had a brush with deadly disease. She speaks her mind to Nathan more often, and seems more energetic. This makes Leah more eager to question Nathan’s authority as well—she wonders where women fit into heaven. She also begins to realize that in Nathan’s ideal world, a woman’s intelligence doesn’t count for anything; she’s judged for her beauty and nothing else. Leah wonders what kind of God would send her family to the Congo, a dangerous place. Interestingly, the presence of danger in the Price women’s lives inspires them to stand up to Nathan more and more frequently. Leah really begins to doubt her father’s wisdom here—she can see that Nathan doesn’t respect strong, intelligent women in the slightest. And because Nathan is so inextricably tied to religious faith for Leah, questioning Nathan also means questioning God. Arn, Jackson. "The Poisonwood Bible Book 3, Chapter 33." LitCharts. LitCharts LLC, 29 Jun 2016. Web. 20 Apr 2019. Arn, Jackson. "The Poisonwood Bible Book 3, Chapter 33." LitCharts LLC, June 29, 2016. 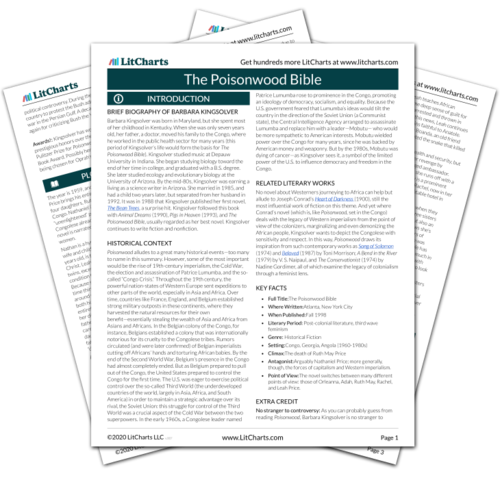 Retrieved April 20, 2019. https://www.litcharts.com/lit/the-poisonwood-bible/book-3-chapter-33.